Talk to any person involved in game development, and they most certainly have a game idea that they would love to realize if given the resources and the chance to do so. Wouldn’t it be nice to be calling the shots and instructing everyone to build the game that you have envisioned in your mind? When beginning game developers think about what a game designer does, the first things that pop into their minds is that the designer comes up with the main gameplay idea and the game mechanics. This is, at least for me, the most fun part of game development. After all, you get to try out new ideas and think about the very core of the game. But while that is indeed a part of what designers do, it’s often overlooked how many details and much smaller things need to be decided. To give you a better idea of these details, let’s have a look at the example. 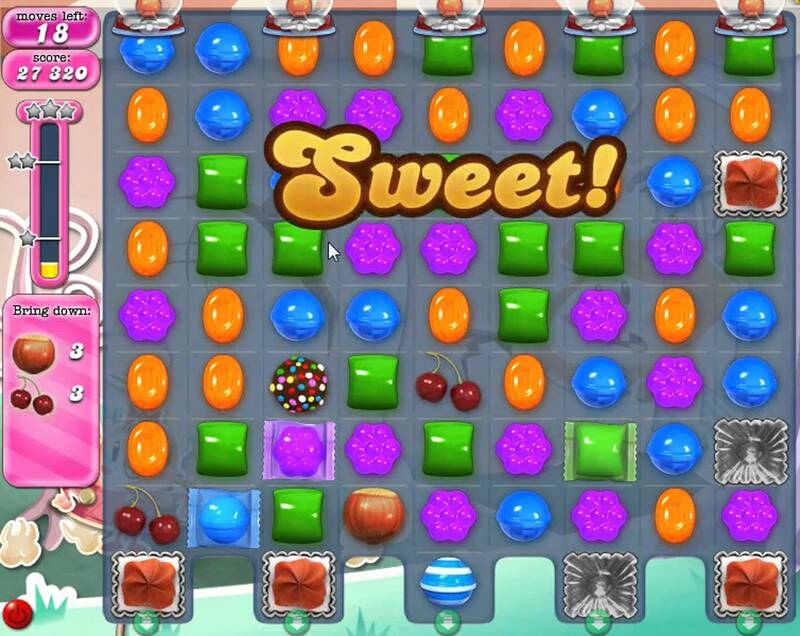 Suppose you wanted to create a ‘match 3’ game, such as Candy Crush Saga (see the picture) or Bejeweled. The popular match 3 game, Candy Crush Saga by King. Sounds fairly simple, right? Now, even from this short written idea, we run into dozens of unanswered questions that have to be addressed by the designer. Below, you’ll find a few examples of these questions, which I’ve placed into different categories for clarity. How can the gems be moved? By swapping the place of two gems? In some other way? How many points do you get for a match of 3, 4 or 5? What about a T-, L- or +-shaped match? Do you get more points if you make simultaneous matches with one move? If yes, how many more? How will the empty positions be filled? Do the gems drop down from above to the empty spots and will new gems be created on the top of the screen? When will the new matches be checked during cascades? Is the checking continuous so that whenever a new match is made, it will be registered, or do you wait until all the empty positions have been filled and no gems are falling anymore? Is it somehow possible to make a bigger match than a match of 5, e.g. due to a cascade? Should the player be rewarded by giving more points for these? Is the core mechanic easy to pick up? Does it still have enough depth to keep the player interested in the later levels? Is the mechanic rewarding for skilled players, or does it have ‘an extra layer’? In other words, is it possible that some people can enjoy the game without ever knowing about this ‘layer’, but the expert players who know how to use it, can achieve higher scores? What kind of effect should take place when a gem is matched? Should the gems shrink, glow, fade away, or should the effect be a combination of these? In the case of glow, is the glow effect reserved for anything else in the game that the player might confuse it with? Where do you display the points for each match? What kind of animation do the shown points have? Do they slowly move upwards while fading, or do they jump up and then fall down to the spot where they were created, and then disappear? What kind of sound should the gems make when you match them? In cascades (i.e. making multiple matches in a row with a single move), should the match sounds become higher in pitch and different in other ways? How much higher and different in what way? What GUI elements should be included, and how should they be placed to convey all the necessary information to the player in an efficient way? Are the buttons big enough to be pressed on mobile devices, but not so big that they take up too much space on the screen? So, as you can see, when you delve deeper into your initial game idea, you’ll notice that there are lots of design problems that need to be solved. When you’re imagining your dream game, you’re most certainly not thinking about the placement of GUI elements first! Like the GUI issues, many of these questions pop up along the way, and many are problems that you didn’t initially even think about — especially if you’re planning to include some new ideas in your game. There is also another important aspect in what game designers do: Communicating their ideas to others. Unless you’re working completely alone, you have to be able to convey your thoughts to your team, and that can be a difficult task: In your imagination, you know how something should look, sound and feel, but how do you put that into words so that other people would get the exact same idea? More often than not, it’s impossible. You can, however, give them a rough idea of what you had in mind. 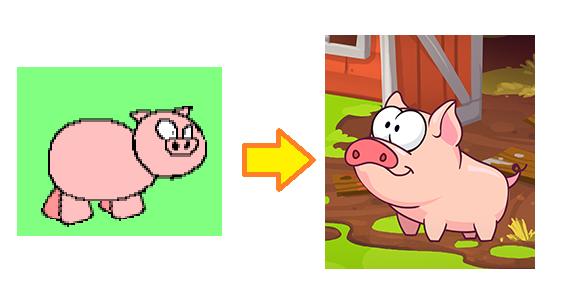 The pig character in Farm Panic looks quite a bit different in the prototype than in the final version. On the left, you can see my initial 15-second masterpiece, and on the right, the artist’s final representation. Despite the poor quality of my scribbling, it was helpful in getting my idea across. For this, you either need to have good written skills, the ability to draw, or both. The former will allow you to present all the required details for the assets in a clear way. The latter serves to complement your written documentation and is especially helpful when you’re asking an artist to draw something for you. Usually, even rudimentary scribblings (the ones I specialize in, heh) can help with getting your idea across to your team. As they say, a picture often tells more than a thousand words. If you can’t create the kind of reference you want, you can also try to find reference material online. For example, pointing out sounds or musical themes from other games can help you establish the general style for audio with your team even if you have zero knowledge of audio engineering or composing. In the Disney movie Big Hero 6, the main character Hiro uses his imagination to command microbots to do exactly as he wants. Let me know when microbots are sold in stores — they would make game development so much easier! Watch the full clip at https://www.youtube.com/watch?v=dSkuzg7YCo8. Well, that’s it for this time! In a nutshell, this covers what the job of a game designer is like. In my next posts, I will discuss the creation of our upcoming game, Gem Slide. In those posts, you will see how I solved some of the design problems I faced.